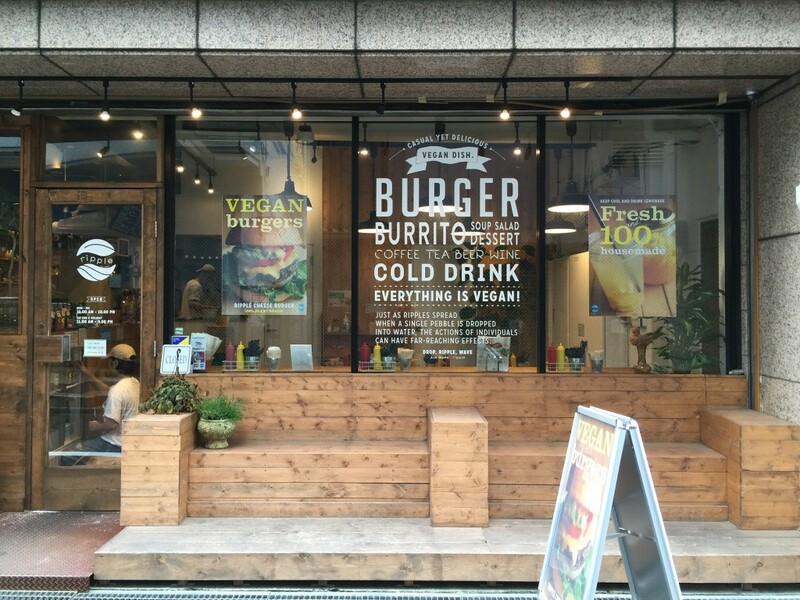 If you’re a hungry vegan, you’ll be delighted to learn that there are some great vegan restaurants in Tokyo. 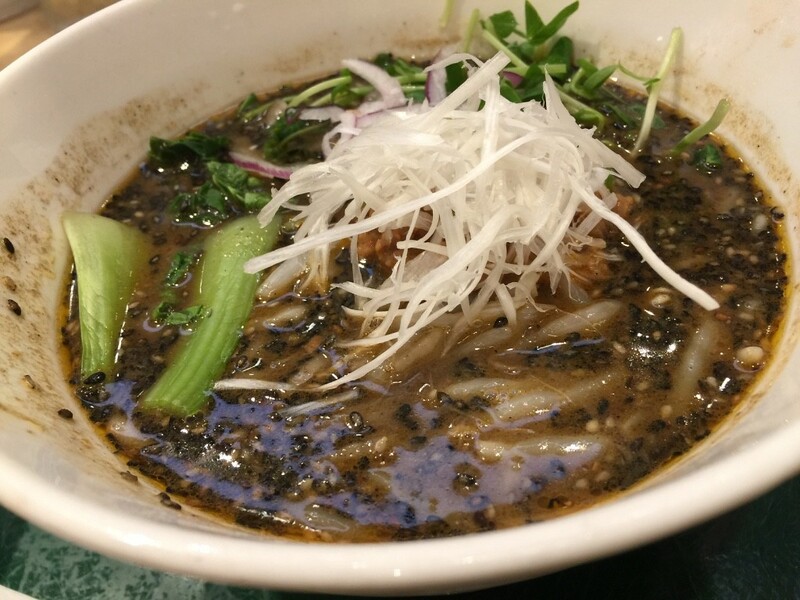 Here, Mario and Shiori Leto introduce three of their favorite vegan eateries in the city. 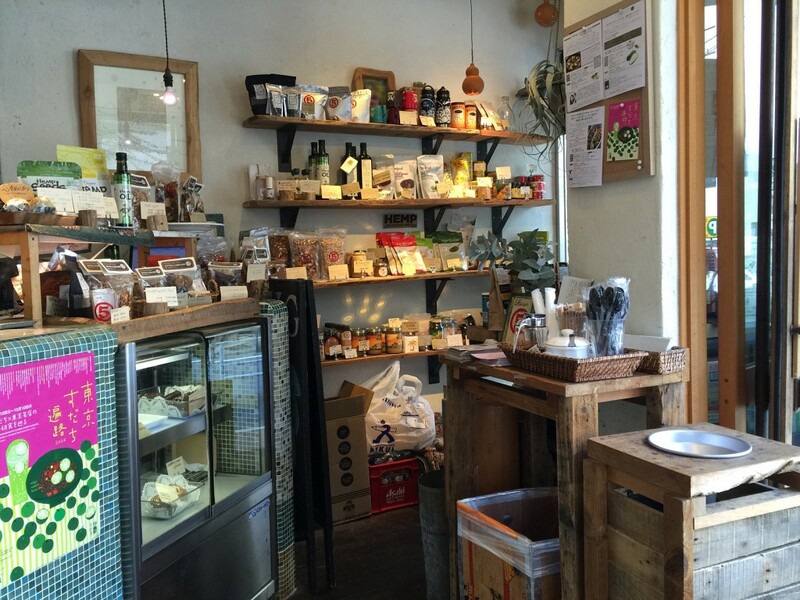 Ain Soph Ripple is the fourth vegan restaurant in the Ain Soph dynasty. 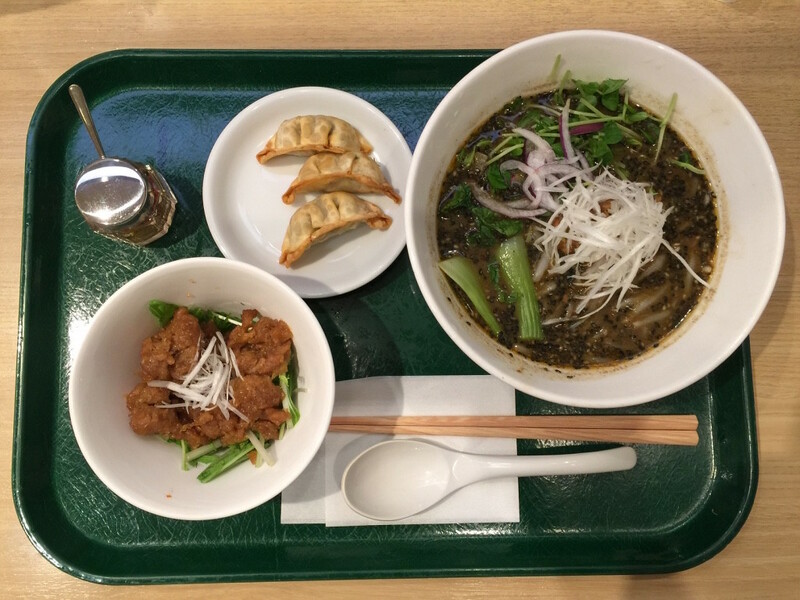 It's conveniently located at the edge of Kabukicho in Shinjuku and offers a culinary experience rarely had in vegan restaurants: nitty-gritty fast food. If burgers, burritos, and French-fried potatoes are what you crave, then Ripple is the place for you. In mystic Jewish lore, Ain Soph is the name of God before God became God. God it? 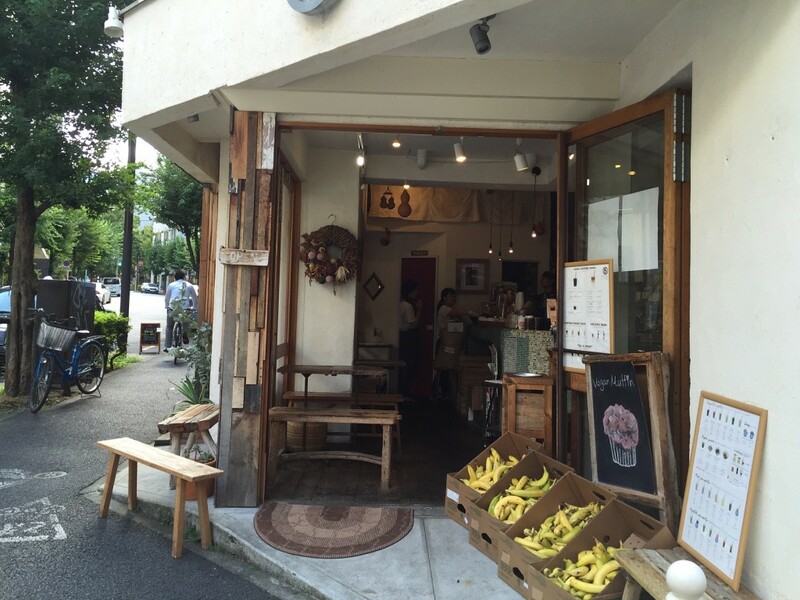 In Tokyo, Ain Soph is a chain of well designed and meticulously executed vegan restaurants. What's the connection between the two? Read part of the restaurant's concept statement and decide for yourself: "Just as ripples spread when a single pebble is dropped into water...you yourself can be the pebble causing the ripple effect." The first three Ain Soph organic-food-based restaurants were opened in Ginza, Shinjuku, and Ikebukuro starting in 2009. 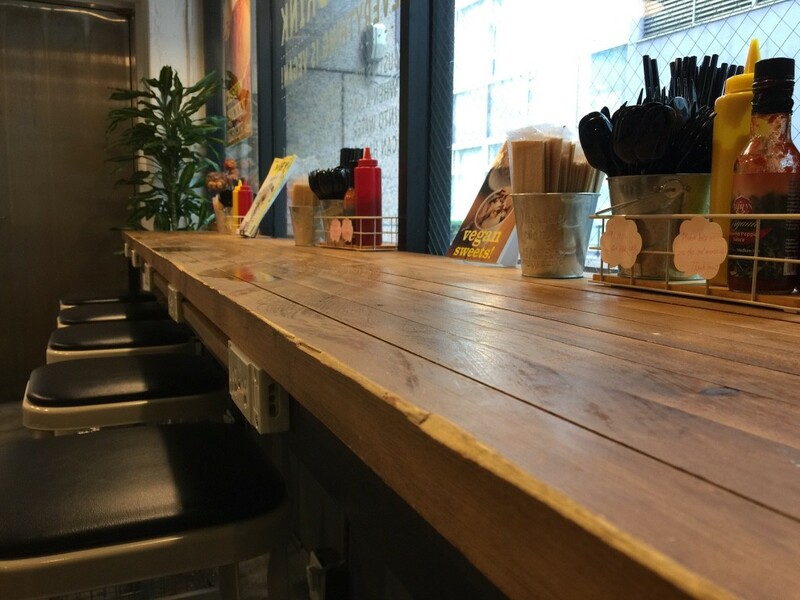 The latest addition, the very different Ain Soph Ripple, opened in Kabukicho in December of 2015. As shown on the menu in the photo above, there are two prominent themes at work: veganism and simplicity. 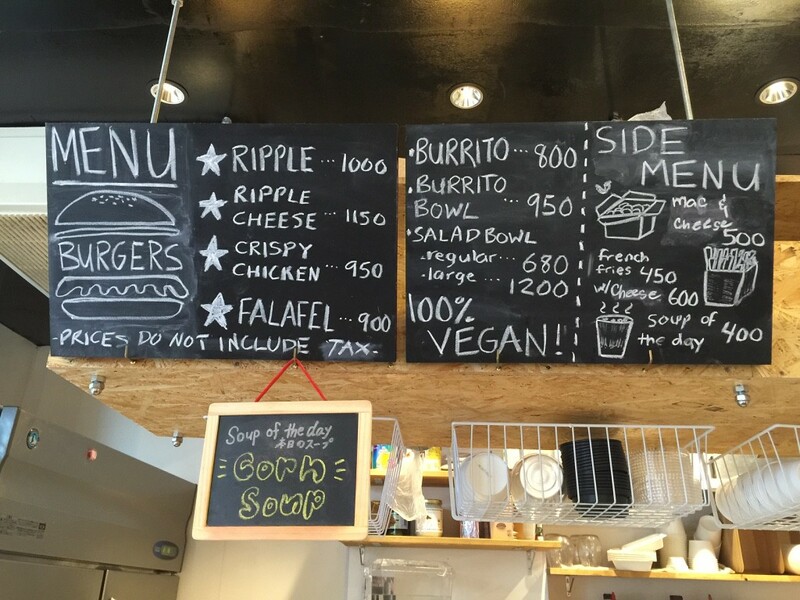 Everything is vegan and the menu is burger-stand simple. Ripple can be accessed most easily from the Seibu Shinjuku Station in Shinjuku (one easy minute from the North Exit), a station that is inconveniently detached from the JR Shinjuku Station. 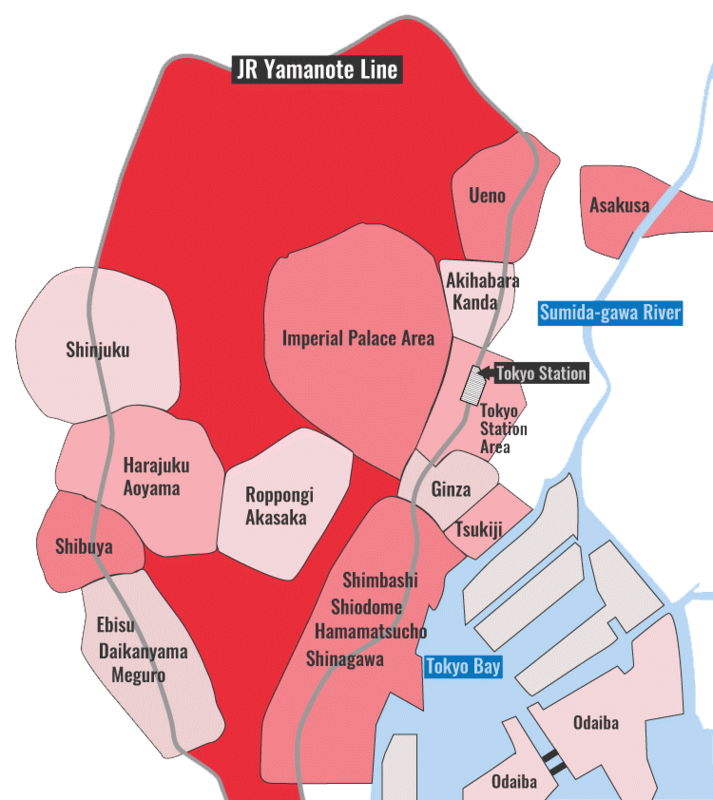 If you are coming in from the northern Yamanote line, change to the Seibu Shinjuku line at Takadanobaba and go one stop south (12 minutes from Ikebukuro, ￥280). If you are on the Sobu line, get off at Okubo Station (20 minutes from Akihabara, ￥170) and make the 8-minute walk. If you are coming from Shinjuku Station, pull out Google Maps and try not to get distracted along the way (15 minutes on foot). Everything on the menu at Ripple stokes curiosity: burgers, cheeseburgers, burritos, macaroni and cheese, chicken sandwiches. How do they make veggie versions of food traditionally made with meat and other animal products? I'm not so sure about the answer to that question, but I know from experience that they do a great job of it. The Ripple cheeseburger (￥1150) was soft and succulent and sent streams of gooey cheese, avocado, and tomato juice running down my forearms. Definitely messy, but savory and surprisingly delicious. In a nutshell: I'm vegan and that's probably the best vegan burger I've ever eaten. Snap. 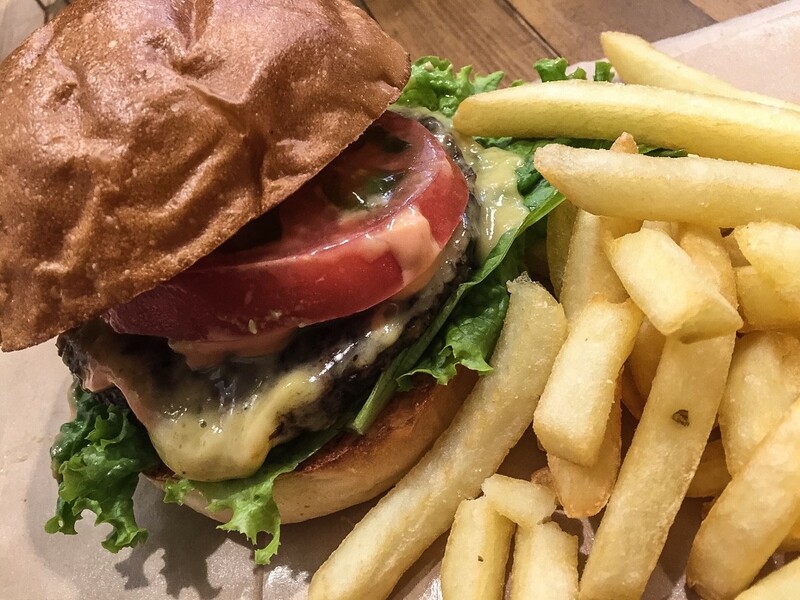 I must confess that I am a shameless glutton, so it should come as no surprise that the cheeseburger-n-fries set (fries an additional ￥200) was not the only food I ate the day I visited Ripple. 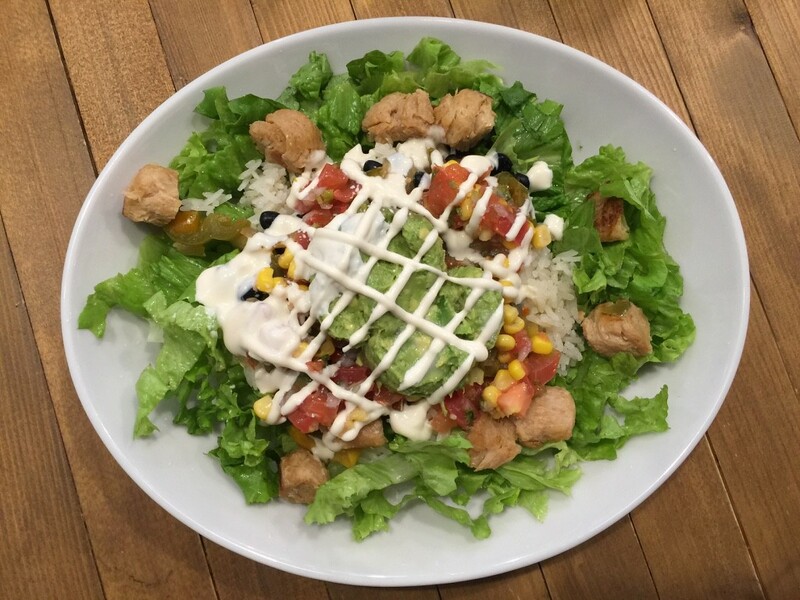 The burrito bowl (￥950) was also on my hit list, as was the crispy chicken burger (￥950) and the large salad bowl (￥1200). Luckily for my waistline (vegan food does not necessarily connote healthy food), my partner assisted me in my feeding endeavor. The texture of the crispy chicken burger was surprisingly similar to chicken meat. Obviously made with soy protein (as were the chicken bits in the salads), it was stringy yet moist and substantial in texture. Admittedly it was a bit too salty, but easy to overlook if you're vegan and a past lover of fried chicken. One feature of note for all the burgers: The buns, which were light and chewy in a pleasingly mandibular way. Salads are not really necessary to supplement the burger experience, but they are certainly tasty too and might interest some people as main courses. The burrito bowl is the burrito without the flour tortilla. Both are mock-Mexican goodness with avocado, white rice, corn, lettuce, tomato, soy meat, and other veggies covered in a vegan mayo sauce. 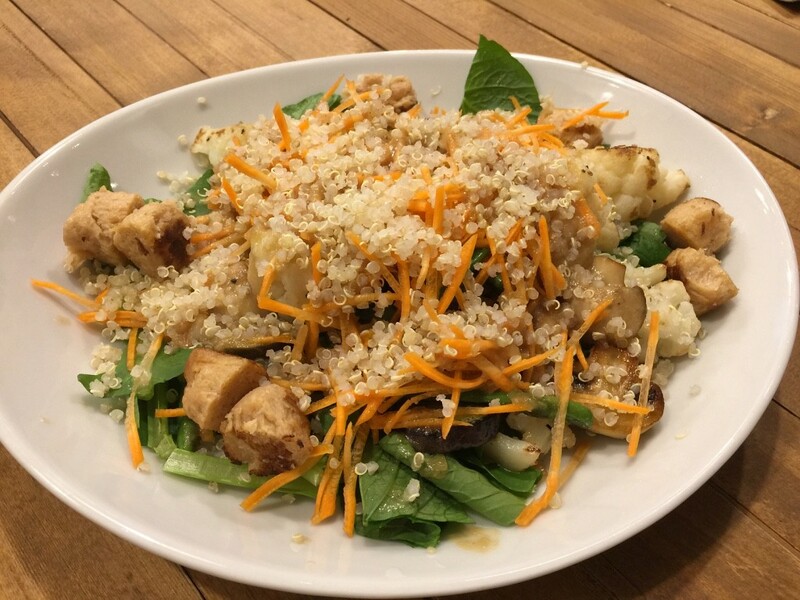 The salad bowl includes quinoa and julienned carrots over an assortment of stir-fried veggies. In the words of an emotionally earnest American: Sweet! Awesome! Faaaaaaantastic! Ripple pros: Great tasting food and amazing renditions of traditional meat dishes. Ripple cons: High prices and limited seating. As a financially sound vegan myself, the prices are negligible. I am always willing to pay for great food. But not being able to grab a seat is a bit frustrating. There are around 16 seats in the place and sometimes local groups of diners spend more time chatting after lunch than they do consuming their food. Solution: Arrive at 11:00 when the place opens and is empty for a good hour or so. Last but not least, there are also vegan desserts for sweet tooths and some nice IPA beers for that burger-n-beer connoisseur. Check the menu on the website for all options. 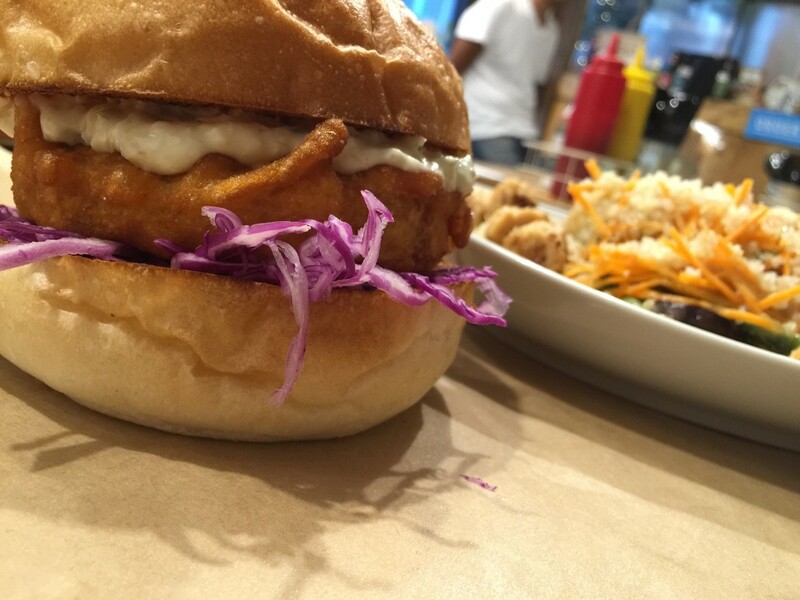 Overall, Ripple offers one of the best vegan burger experiences in the city. Despite the high prices and limited seating capacity, it's definitely worth the time for a quick lunch or an early dinner before a night of drinking. 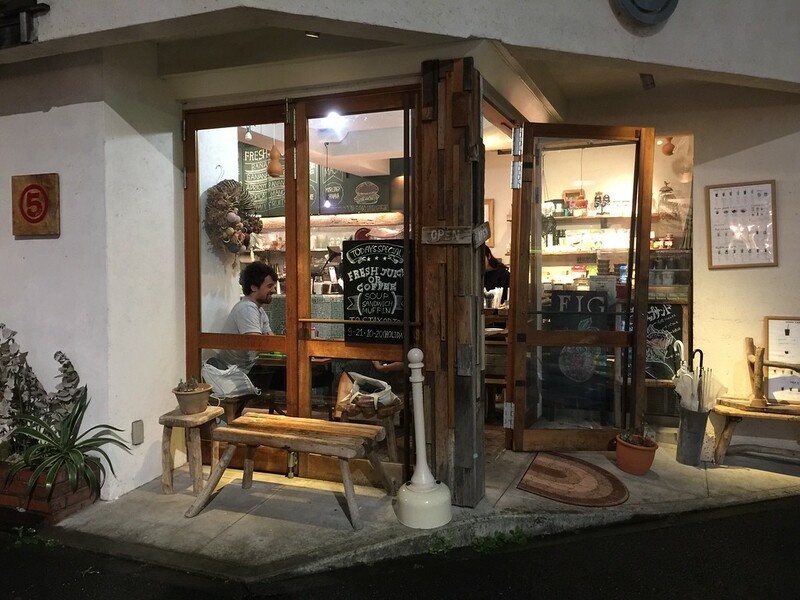 If you're vegan and looking for that memorable vegan dining experience in Tokyo, Ripple is one of several places in the city to etch into your travel schedule. See you there! T's Tantan is another vegan restaurant in Tokyo that pushes the boundaries of vegan-food expectations. The culinary focus is Asian comfort food, so imagine all the previously taboo meat-based Asian specialties you secretly longed for, and now imagine them again in vegan versions. That's T's Tantan in Tokyo. Tremendously tasty! T's Tantan is an extension of T's Restaurant in Meguro Ward, which opened in September of 2009. 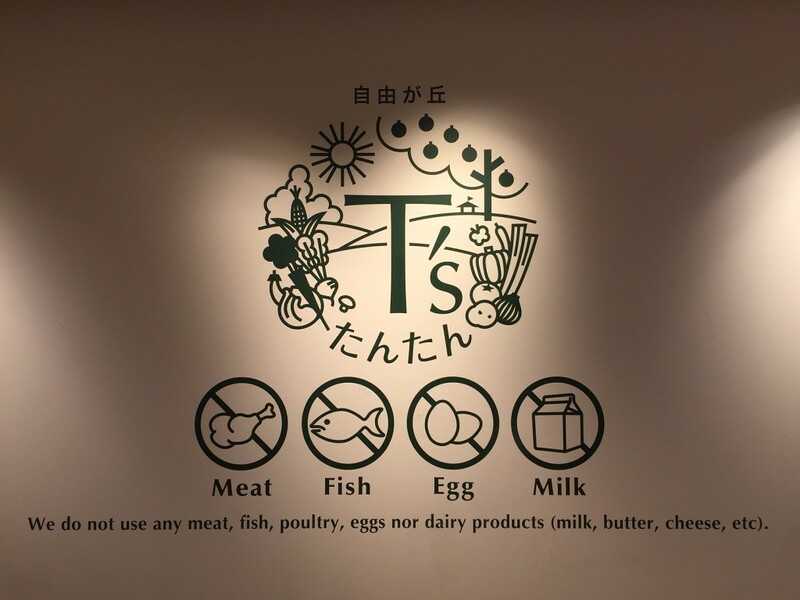 Less than two years later, T's Tantan opened inside Tokyo Station, and then four years after that, another T's Tantan opened in Sendai Station in the Tohoku region of Japan. If you're interested in reading a brief history of how the shops came into existence and how the owner's veggie philosophy is spreading to school lunches and air travel, check out this link. 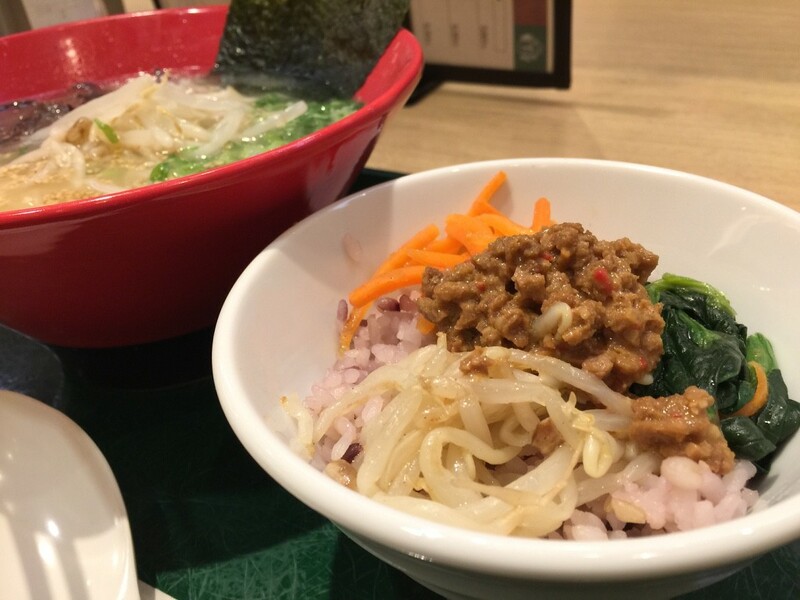 T's Tantan is located inside Tokyo Station. Let me repeat that: Inside Tokyo Station. Do not exit the gates. Do not walk around the outside of the station. 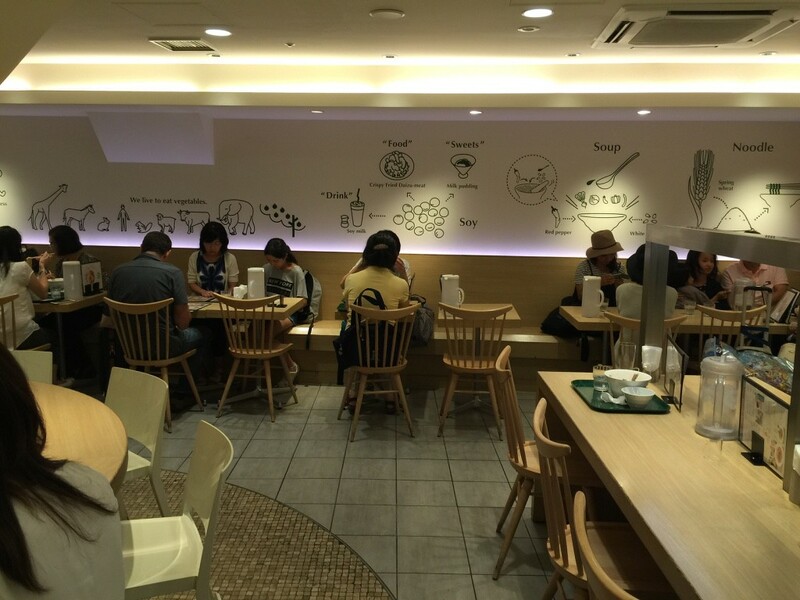 Do not write a restaurant review complaining of the time you wasted hoofing it around Chiyoda Ward. Stay inside the gates of Tokyo Station, which is on the Yamanote line, and head toward the Keiyo line which is to the right of the bullet-train gates. It's on "Keiyo Street" and is the last shop on the right before you descend the stairs. There should be a line outside. Get in it. The term "tantan" comes from the Chinese Shichuan dish tantanmen, which is noodles and veggies in a spicy broth, usually with chili oil and sesame paste. Half of the noodle dishes at T's Tantan are tantan dishes, and the other half are ramen dishes, which aren't necessarily hot and spicy. In addition to noodles, T's also has gyoza (pot stickers), curry and rice, bibimbap (Korean pickled veggies on warm rice), Asian fried (soy meat) chicken, stir-fried veggies over rice or noodles, and many other options to choose from. I arrived at the shop with a friend around 13:30, just after lunchtime, and had to wait about ten minutes to get a seat despite the surprising number of empty seats inside. With that said, the staff was friendly enough, the service rather speedy, and we were offered an English-language menu which came replete with color photos of all T's culinary options. It was a bit exciting to think that I would be eating ramen sans animal products. The broth, you see, is the problem. 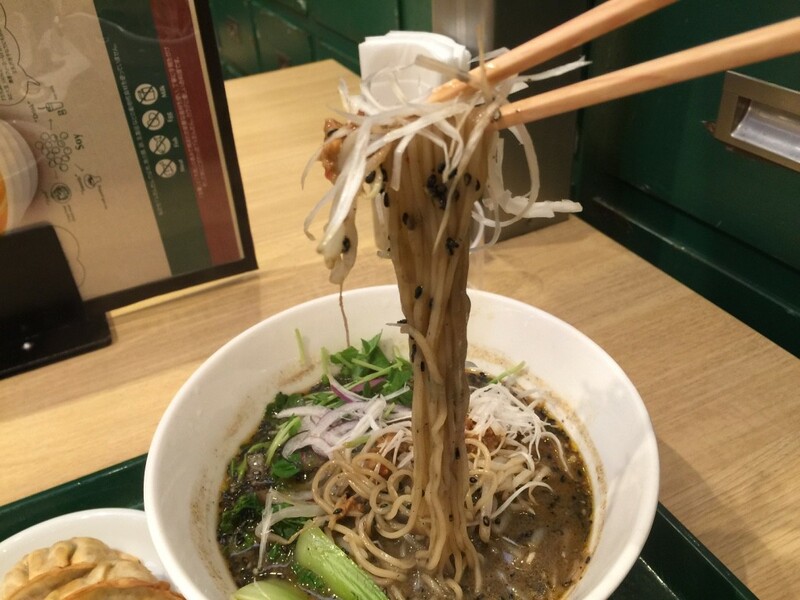 While many ramen dishes are filled with only veggies and noodles, none are made without a broth slowly simmered with pig bones and animal fats. This is the pride of the ramen chef. I ordered the black sesame tantan (￥880), pictured above. It had a robust sesame flavor and a slightly delayed spiciness that forced me from mouthful of noodle to mouthful of noodle. It was definitely rich and savory and, against my better judgment, I ended up drinking all of the leftover broth after the noodles were gone. It was a totally tasty tipple. My friend ordered the vegetable tonkotsu ramen (￥800), pictured above. Tonkotsu is a regional variation of ramen from the Hakata district of Fukuoka. 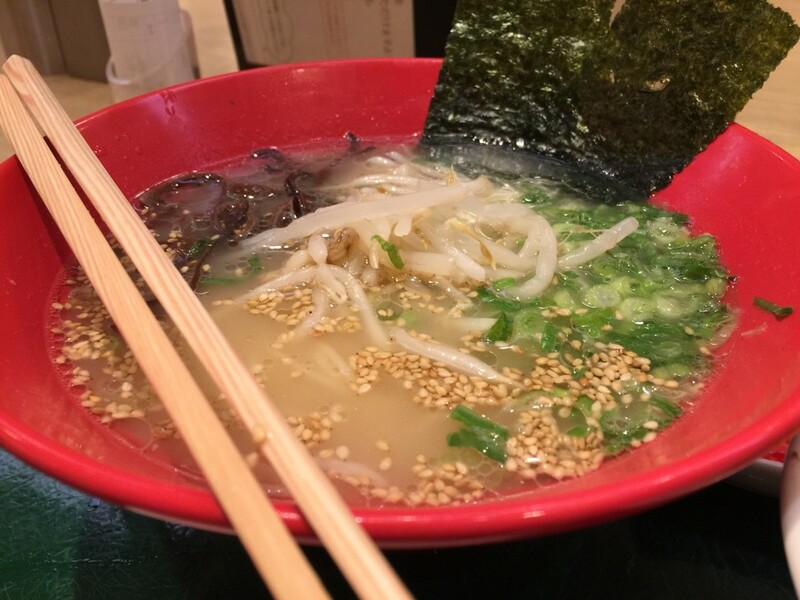 The broth is simmered with pork bones (= tonkotsu) and is usually creamy white in color from the melted bone marrow. Fans of this variety are unquestionably loyal to the tonkotsu culinary cult, as was my friend who never orders any other kind of ramen. I had a bite and the broth was light and salty and the perfect complement to the noodles. 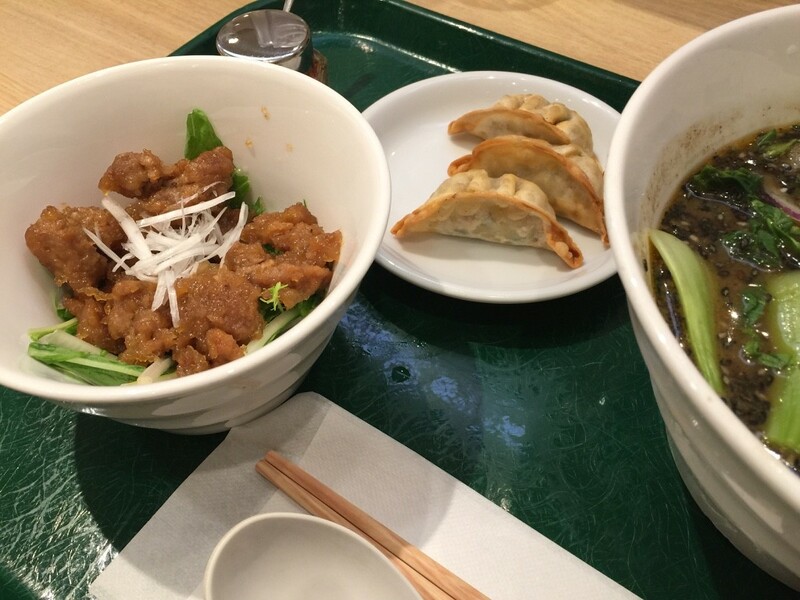 In addition to our main noodle dishes, we also ordered a few side dishes to satisfy our vegan curiosity: the gyoza (3 for ￥250), the Asian fried chicken (￥350), and the bibimbap (￥450) (see explanation in paragraph four). The fried (soy meat) chicken was outstanding in a sweet-n-salty sauce on a bed of greens with some shaved leeks as garnish. The bibimbap was also quite nice with a light veggie flavor highlighted with sweet-n-sour bits of soy ground meat: carrots, spinach, bean sprouts, and soy meat on a bed of white rice. The gyoza, on the other hand, left something to be desired. The inner contents were dry, as was the shell which had the consistency of cardboard. If you are a gyoza connoisseur or have grown up eating gyoza or have struggled to perfect it in your own kitchen, then this news is no shock to you. Great gyoza are hard to come by. There are three basic necessities: A shell that's crispy and browned on the outside, chewy on the inside, and completely sealed, which means that when you take your first bite, juices from the stuffing inside squirt and run and drip down your everything. With T's gyoza, it wasn't, so didn't. But that's okay because for vegans cruelty-free and vegetable-based are always delicious. Overall, the shop interior was comfortable enough for a semi-fast-food experience and the staff was always present and helpful. There is usually a line to get in, but according to most online reviews, turnover is quick (semi-fast-food!). The prices too are reasonable, especially the set meals which fetch around 12USD for a main dish, rice, two veggie dishes and a dessert. The best part was that the food didn't leave you bloated and belching garlic for the remainder of the day like meat-based ramen does. If you're ever on the Yamanote line wondering where to find a fast veggie-based meal, get off at Tokyo Station and make your way to T's Tantan. It's titillatingly top-tier! Tata. 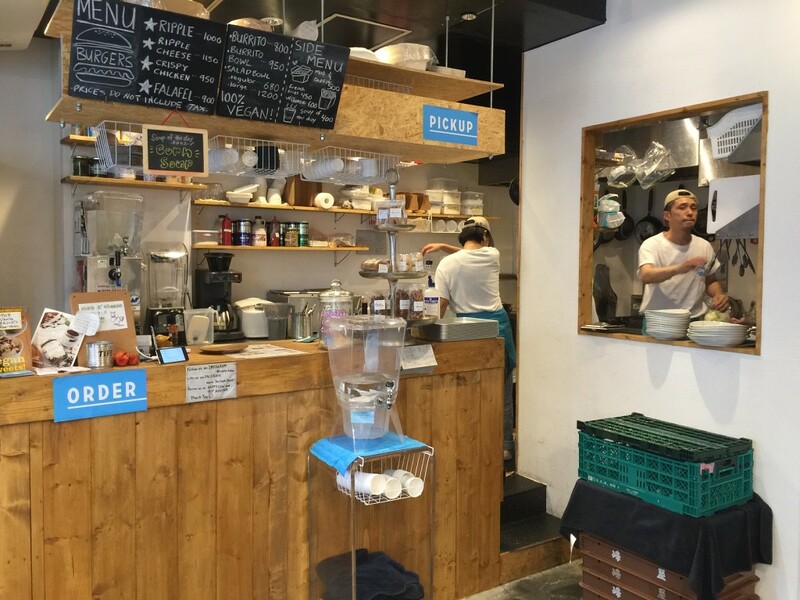 Marugo Deli is a small cafe down the side streets of Shibuya Ward near Ebisu Station. 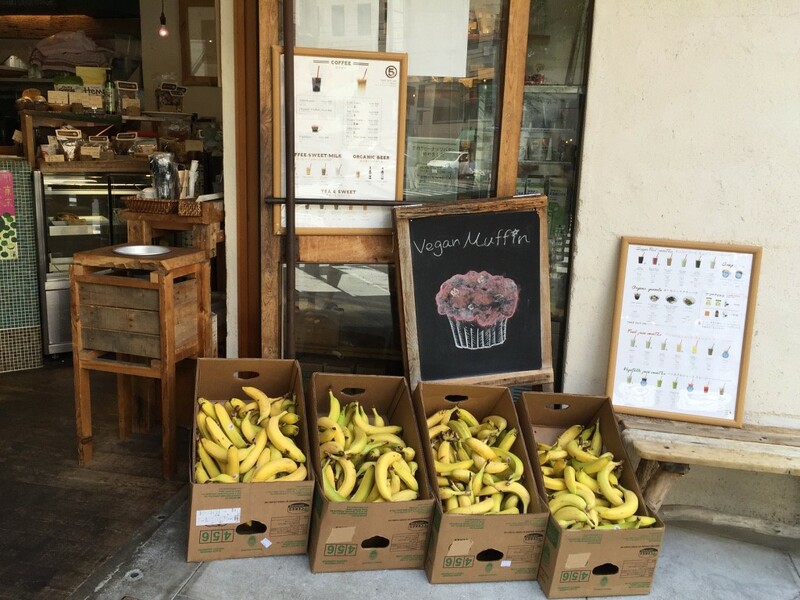 It offers a limited selection of vegan fare, like burgers and wraps and cakes, but is probably better known for its fruit and veggie smoothies. If you're vegan and crave a break from the typically oily solid foods, or not vegan and just need to give your body a break, then Marugo Deli is the place for you. The name Marugo is a combination of two words: maru and go, which means "circle" and "five". 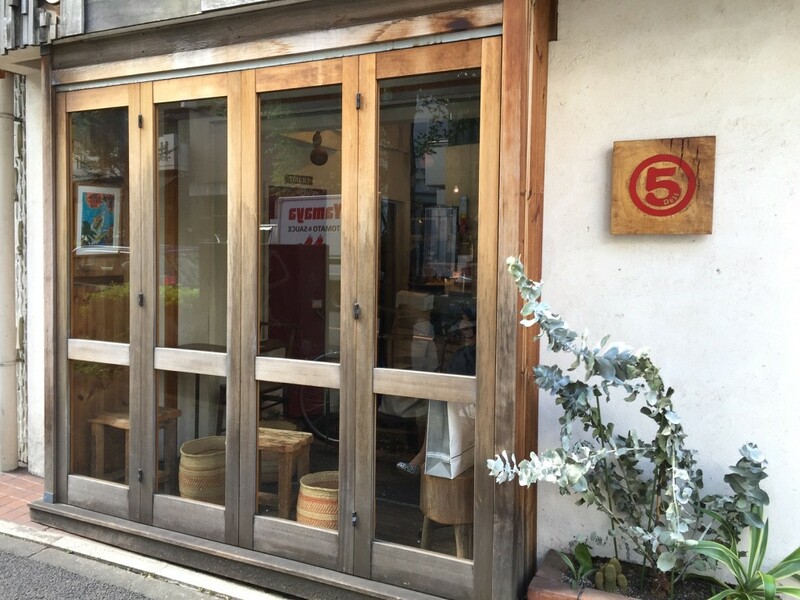 The reason I tell you this is not because I know why the number 5 in a circle was chosen as the name, but because you will not see the name of the cafe written out in Latin script on the storefront. Instead, you will see this ⑤, as in the photo above. 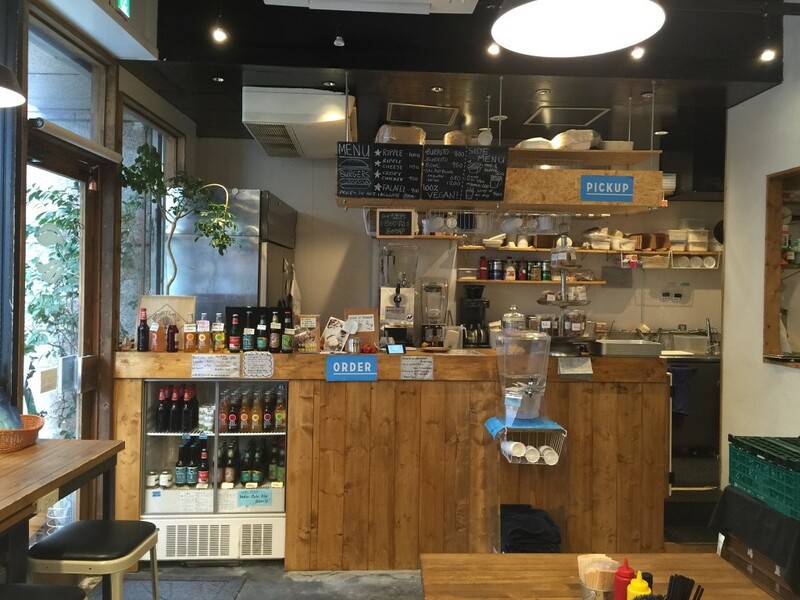 Marugo Deli is easily reached from Ebisu Station on the Yamanote loop line. It's about a five-minute walk from the West Gate. Exit and veer left past the Hibiya line underground. Cross the main road, Komazawa-dori, and head down the side street with Kentucky Fried Chicken (sorry!) on the corner. Marugo Deli will be several blocks down on the far left corner. 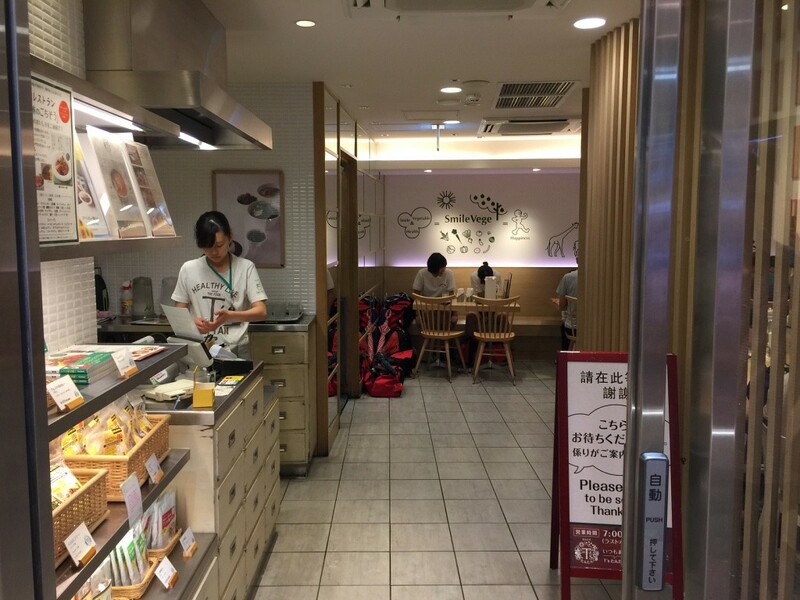 The first Marugo Deli was opened in Tamachi in Okayama Prefecture and was soon followed in mid-2011 by the Ebisu shop. It's mostly vegan and advertises its fare as such, but it's not just about meatless meals: The food is always additive-free, the ingredients sometimes organic, and everything is locally sourced when possible. In addition, the benches are made from ocean driftwood and the speakers are made from gourds to provide an environmentally friendly eating space for its patrons. On my last trip to Marugo Deli, I got a veggie wrap (￥500) and an organic banana muffin (￥400), both seen above and below. 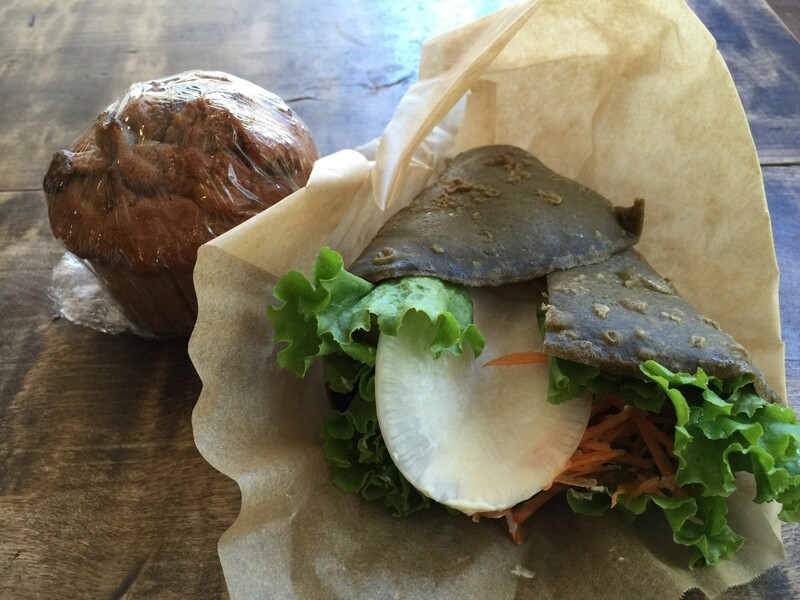 The veggie wrap was filled with fresh leaf, carrots, radish, and other veggies drizzled with a vegan mayonnaise. I'm not sure what the wrap was made of, but it was light and soft and held everything together under biting pressure. 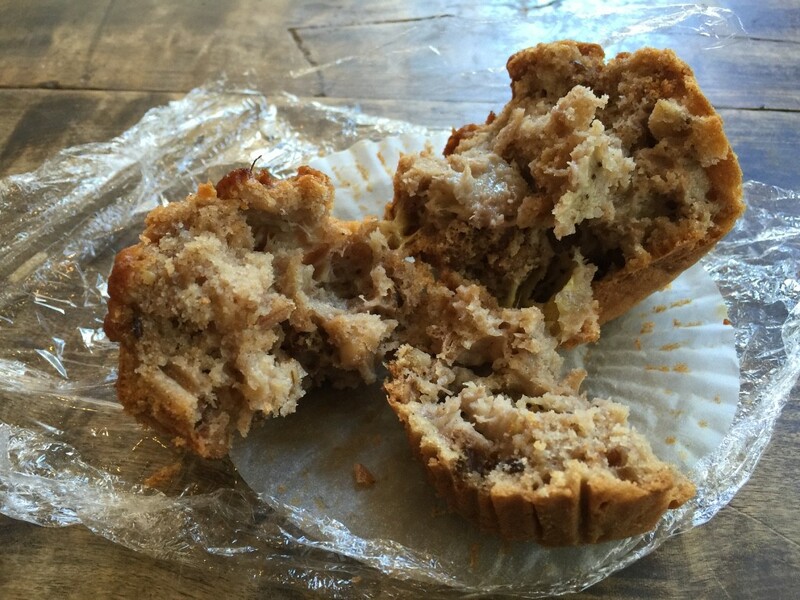 The muffin was moist and not too sweet and was a nice complement to the subdued flavors of the veggie wrap. The overall focus of the food seemed to be on the natural flavors of the ingredients, and in that respect was a great success. 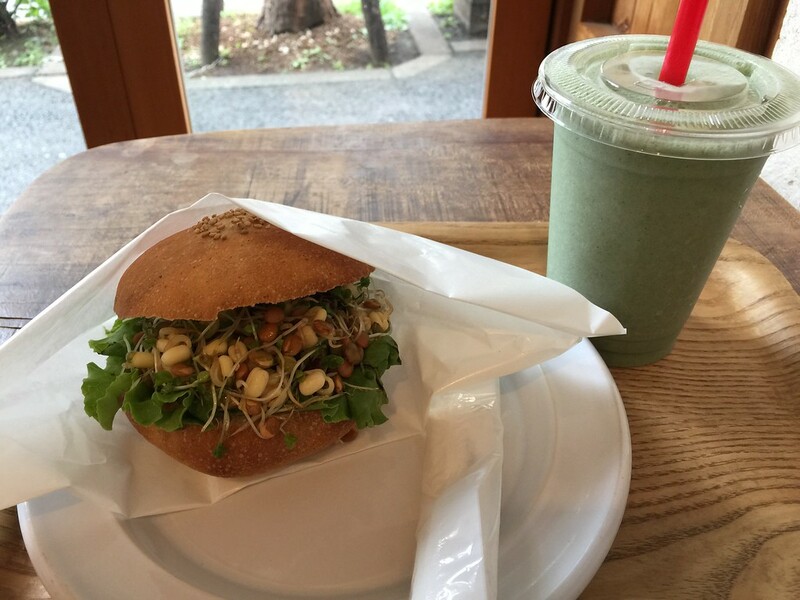 My friend got the bean sprout burger (￥500) and detox smoothie (￥850). Good points: the smoothie was tasty and our bodies didn't go into detox shock. Bad points: the sprout burger and bun were dry and tasteless. It felt like something was missing and I wondered if the server didn't prepare it properly, but at the end of the day it was still relatively healthy and so we didn't mind too much. I wouldn't order it again (not after being to Ripple!) but I will definitely head back for another smoothie. While some smoothie varieties are seasonal and not always available, at the moment of this writing (early October) there are about 17 kinds to choose from, each from one of three basic categories: fruit smoothies, vegetable smoothies, and super-food smoothies. The detox smoothie was a super-food smoothie and boasts 19 different super foods in its ingredients list. Some of the other kinds across all three categories include Raw Cacao Maca, Acai, Dates Banana, Topical Mango, King Green Mix, and Avocado. Just be careful because a few of the smoothies use milk. Everything is clearly labeled, but if in doubt, ask. In addition to the cafe, there is also a kitchen cooking space next door that the owners use or rent for cooking lessons. At the moment, there is scheduled a macrobiotics cooking class, a hemp cooking class, and a salad master cooking class. One more thing: There is a small corner of the store that sells groceries like chia seeds, hemp oil, maca powder, and homemade granola. In my experience, it's all a bit overpriced, but at the end of the day, what price do you put on your health? So that's Marugo Deli. The solid food can be hit or miss and changes daily, but the smoothies are definitely worth the time and your body will thank you for it. Or just drop by for a few healthy groceries, a cup of organic coffee, or an organic beer. It's not too far off the beaten path and you can even stop at the owner's hemp-clothing shop, Juzu, next door. Happy travels! Shiori Leto studied washoku at Ecole Tsuji Tokyo and macrobiotics at the Kushi Institute of Japan. She has also studied gluten-free cooking and is a certified raw-food instructor. Her website can be viewed here.